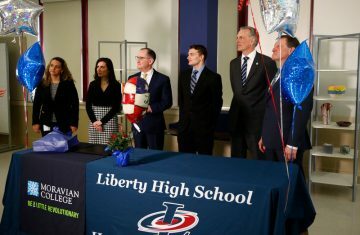 Two high school students from Bethlehem Area SD will enjoy a four-year scholarship to Moravian College, thanks to a partnership between the district and the college. The Superintendent’s Moravian Scholarship is given annually to a student at each of the district’s two high schools, Liberty and Freedom. Moravian College President Bryon Grigsby suggested the scholarship as a way to deepen the bond between the college and its hometown school district. This year’s winners are Olivia Swiadek and Dennis N. Rosado. Both students will be the first in their families to attend college and have overcome great obstacles while still excelling in school. Read more about their stories on LehighValleyLive.com.